The latest Entertainment Weekly cover. The amount of joy that this magazine cover brings me is inexplicable. From the moment I saw it and picked it up, I was wrapped up in all the memories and immediately hopped in that time-traveling DeLorean and took a trip back to the 80’s. Oh, that decade. The one that took me from 11 to nearly 21. From a young girl to almost an adult. The one in which I first met my first true love. The guy on the cover here. Michael J. Fox. From the time the show debuted at the beginning of my freshman year in high school to its finale at the end of my junior year in college, I loved Michael J. Fox. I was recently thrilled to see him walk across my screen as I binge-watched “The Good Wife.” His fight with Parkinson’s is apparent, but the same ol’ cocky smile and “I’ve got this” attitude is there. I love that his character has incorporated his physical issues into the storyline instead of ignoring them–or worse–not letting him do what he does so well. And light up a screen. When I saw the magazine cover and nearly wept, I pondered over what is clearly my frail emotional state. What triggered all of this? Because, y’all, the last time I saw the three of them together, I was in college. Not yet a senior. My biggest concern was finishing the school year and working my summer job. The realities of losing people I love to cancer and other diseases was far from my realm of possibility. The reality of being responsible for anyone other than myself was unfathomable. The reality of all the things that I carry on my shoulders now was just not there. Life was good, even if I didn’t always recognize it, teenage angst being what it is. If I look at this photo for long, I see the age in all of their faces. If I watch Michael J. Fox now on the screen I see the ravages of this Goliath he is battling. And yet, I still see the young man whom I fell in love with 33 years ago. His vitality, his youth, his joy, that smile–they are all still there. I think it’s the same for all of us, that we are carrying something filled with uncertainty or just plain hard–only for some of us, our battles aren’t as public or as apparent as his. Tonight I’m thankful for the happy memories that this one photo brought back. Talking with my high school Algebra I teacher about the show, my Daddy teasing me about “that” boy and his tie, writing “Mrs. 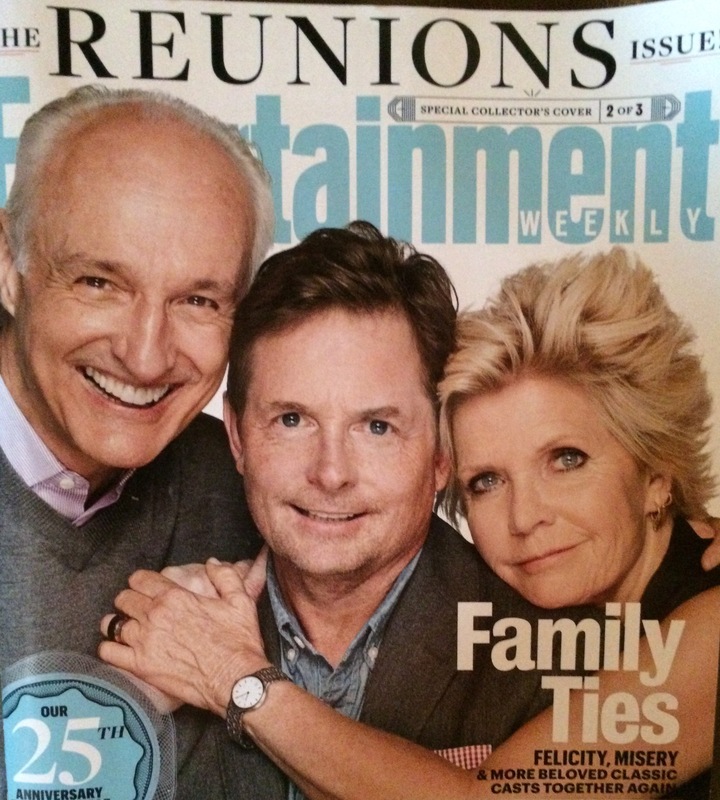 Michael J. Fox” on my notebook, living for Thursday night when it would be on again, and my heart breaking when things didn’t work out with Ellen. I loved that show. And I’m so thankful to be reminded of a time when things were easier and not tinged in the brokenness like they seem to be now. I suppose that’s what comes with adulthood. A lot of tinged-ness. And yet, I look at Michael J. Fox, diagnosed with Parkinson’s at age 30. He could have looked at all the hard things ahead of him and given up, and he almost did. But when he came out on the other side of all of that, he became strong. And better. And he is carrying on “like a beast,” as they say these days. He is taking the cards he’s been dealt and working to change it–so that one day there will be an end to this debilitating disease. And as someone who goes way back with him *ahem*, I’m thankful for his example–his spirit, his drive, and his passion for making a difference. May we all remember our first loves so fondly, and may we be able to find joy in reminiscing, and happiness in where the path has taken us. And may we all seek to transform lives for the better, just like this guy who first won my heart. All those years ago. ps–I’m so glad “Bueller” didn’t take the role. The world would have missed out on a great talent. Exactly. I never could completely accept Courtney Cox as his girlfriend and it is beyond perfect that he and “Ellen” married in real life. From the outside their relationship looks very beautiful. Thanks for sharing the trip back in time with me.